Interior Minister Gamawan Fauzi wants governors and local administrators to cooperate with FPI members. Activists and members of civil society groups slam him for ignoring the FPI's deliberate acts of intolerance towards minorities. One lawmaker describes the minister as a "disoriented person", defines the FPI an "obstacle" to the law. Jakarta (AsiaNews) - Many Indonesians and civil society groups have reacted with astonishment and dismay to a recent appeal made by the Indonesian Interior Minister Gamawan Fauzi who wants regional governors and local administrators to cooperate with the Islamic Defenders Front (FPI). Many on social media have come out against Fauzi. For them, the minister is deliberately ignoring the Islamist group's radicalism and the repeated acts of intolerance by its members against religious minorities, especially Protestants and Catholics. By contrast, for the minister, "The FPI is [part of the] nation's heritage". Speaking at the end of a meeting in Jakarta with Vice President Boediono last week, he stated that the group "meets all the requirements [to work with the authorities] so we can start cooperation". Few Indonesians would agree with him, finding his remarks neither clever nor amusing. 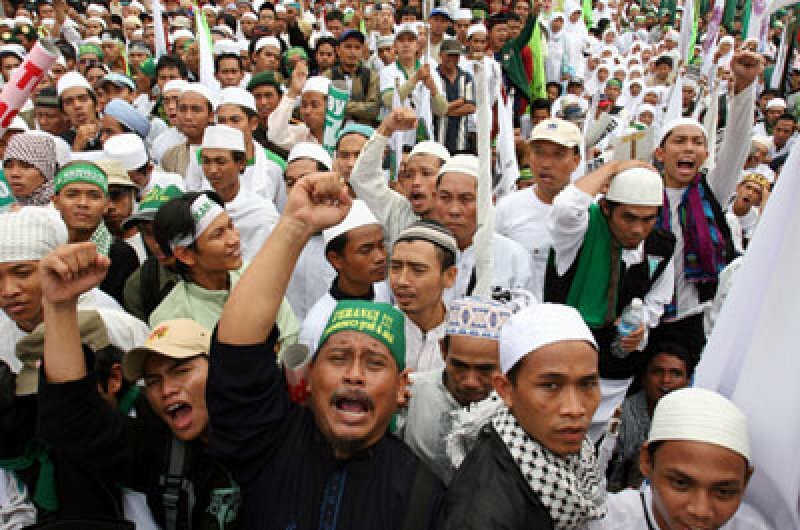 For them, Fauzi seems to ignore the FPI's violent past, including its brutal attacks against minorities, especially Ahmadi Muslims, considered unIslamic because they do not recognise Muhammad as the final prophet. According to activist Fajar Riza Ul Haq, from the Maarif Institute, civil society groups have tried to get the authorities to disband the group, without success. Yet, contrary to the minister's call for regional governors to cooperate with it, "What people want is just the opposite," he said. For many Indonesians, the Islamist movement is nothing more than a faction with violence in its DNA, one that does not hesitate to use force to "solve" problems, whether prostitution, lap dancing clubs or blasphemy. Eva Sundari, a leading minority rights advocate and a lawmaker elected with the Indonesian Democratic Party-Struggle (PDIP), also criticised the minister for his remarks. Describing him as a "disoriented person", she considers the FPI a "serious obstacle" to the application of the law in many parts of the country. Although the world's most populous Muslim nation, Indonesia has a constitution that recognises basic personal freedoms (including freedom of religion). However, in its recent past, it has seen a rising wave of violence and abuse against minorities, like Christians, Ahmadi Muslims and others. In certain parts of the country, especially Aceh, the only province that enforces Islamic law, the lives of ordinary Indonesians have been negatively impacted by a more radicalised and intrusive form of Islam. In this context, the FPI has played a leading role in a broad campaign of 'Islamisation'. In a number of places, its members have used violence to impose Sharia-inspired rules and regulations, such as a ban on alcoholic beverages and the prohibition of certain sexual mores. The group, which is opposed by most Indonesians, has also been accused of blocking church construction, using violence to achieve this goal. Since 2000, it has also been blamed in connection with a series of terror attacks that targeted the US Embassy as well as bars, nightclubs, and private clubs, especially during Ramadan, the Muslim holy month of fasting and prayer.